The pancake tortoise has a flattened, flexible body that gives him the perfect body for the rocky outcrops of southeastern African, the creature's native habitat. 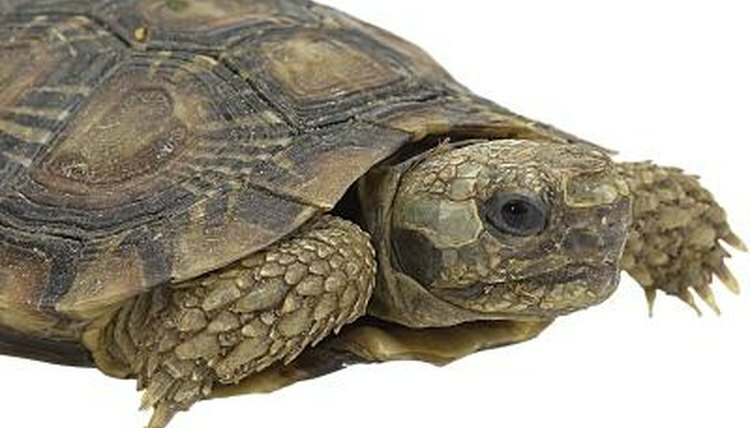 An adult pancake tortoise can reach up to 7 inches long but only 1.5 inches thick. The species is a hardy, with an average life span of 25 to 50 years. You can house a pancake tortoise in an enclosure inside or outside. The enclosure size for one adult tortoise must be at least 2 feet wide and 6 feet long. The species is known for climbing, so protect your tortoise with a lid or an inward lip on the top of the enclosure so your tortoise cannot climb out. You want to provide a ceramic heat emitting bulb and a UV bulb; using a timer, set the UV bulb for a 12-hour on/off schedule. Use packed soil as substrate, and use scattered and carefully staked stone slabs or slate tiles throughout the enclosure to help wear down the nails and beak and provide climbing surfaces. Keep the enclosure warm and dry with a ceramic heater. Maintain the basking spot of the indoor enclosure at 95 degrees F with UVB lighting. If you live in a damp, high-humidity area, your pancake tortoise may not thrive in an outside enclosure for an extended time frame, as his species is native to a dry habitat. If you house your tortoise outside, provide him a heated shelter with a ceramic heat emitter during the cooler months, because the species doesn't hibernate. When preparing the enclosure, plant vegetation throughout the enclosure for food, and place multiple caves in the enclosure. Before you place your pancake tortoise outside, make sure the enclosure is escape-proof and predator-proof; use a lid to prevent escapes, and consider a mesh or grated lid to prevent predators from getting to your tortoise. The pancake tortoise species is herbivorous, feeding mostly on fibrous grasses, leafy weeds and greens. Your tortoise will need a low-protein, high-fiber and calcium-rich diet. You can offer grocery-store "spring mix" lettuce blends and greens, but be sure to provide a varied diet. Try to include grasses such as timothy and Bermuda, dandelions, clovers, plant leaves such as mulberry and grape leaves, hostas and even hibiscus and rose blooms. You want to try to replicate the grazing behaviors of a wild tortoise. You should also include a shallow water dish, and provide vitamin supplements. David T. Kirkpatrick; Reptile & Amphibian Magazine; May/June 1993, pages 2-9.